The reason for starting these assorted ramblings was that I desperately needed something to focus on other than the contents of my bank account, and how I could juggle quickly dwindling pots of money, avoiding bank charges which caused already stretched resources to be further depleted. I figured that if I had something else to think about I would be less prone to attacks of the blues. I am not depressed, and I am not sufficiently deluded to think that a good slice of carrot cake can cure depression. But I do think that a warm slice of a home made cake made by a friend can stop a pale blue mood descending into something that makes you reach for your guitar. Here’s the twist. Firstly having been financially crippled all summer, there is now hope on the horizon that our finances may improve and secondly, the autumn is probably the one time of the year where I find it impossible to let anything get me down. In the autumn I am a regular little Pollyanna shouting “hello sky, hello trees, lovely day”. I love the orangeredyellowbrown baked crisp rustling leaves as they shiffle shuffle under your feet. I love misty mornings and sharp October sunshine. I love pumpkins and rosehips and food for free. I love watching my Toddler pretending to help pick blackberries and then deciding he would be more help in quality controlling the ones in the box… I love Halloween, but not trick or treat, I love bobbing for apples and toffee apples, I love the explosion of black and green and orange that hits the shop window displays and I love the food – although partly this is an extension backwards from Bonfire Night. 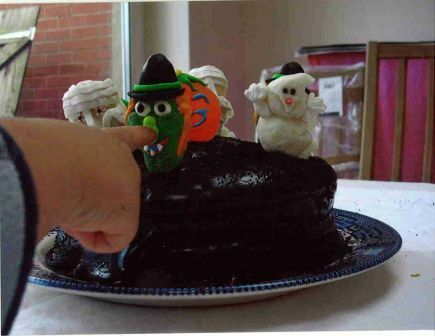 Both Halloween and Bonfire Night are perhaps more notable for savoury delicacies than for sweet stuff (aside from treacle toffee that is), although last year having finally laid my hand on jellied lollipops I treated the Toddler to Nigella Lawson’s Ghoul graveyard cake. Toddler was more impressed by the lollipops than anything else . The cake should anyone else think of doing it is a lovely moist chocolate cake, the icing is very sweet and if you can borrow the sprinkles from someone else – its been a year and I haven’t used them for anything else.